An Irish backpacker has been charged with hiding the body of her newborn while travelling in a remote part of Western Australia. The 25-year-old was charged with “concealing the birth of a child that died before or after birth”, WA police said. The law requires all births to be reported, even if the baby has died of natural causes.The woman had been travelling through the Kimberley region with friends and had not realised she had fallen pregnant, police said. 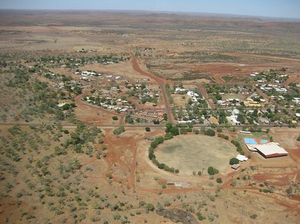 She gave birth one night in May, while at home alone in the town of Halls Creek. She appeared in court in Kununurra at the end of last month, when the case was referred to Perth, and she is due back in court later this year. The charge carries a maximum penalty of two years in jail. It is understood the woman has had to remain in Perth while the court case proceeds. Posted in Misc and tagged Australia, Halls Creek, Irish backpacker at 1:56 pm on August 8, 2014 by Broadsheet. there’s no doubt a whole lot of back story we’re not being told.. I think the backstory is that she got pregnant. I have the feeling that abortion rights will be brought into the story or at least the comment sections. Post-birth abortion rights for all! Abortions for some, mini-Palestinian flags for others. Just up out of bed, are we? A tad late with this story guys. They´re normally at least a day behind the rest of the world. I don’t get how she could have gone the ful term not realising she was pregnant. Impossible. Sounds like she was travelling in de Nile, not Halls Creek. Aye oh! Ba dum tisch! How’s the chicken? What leads you to believe that the pregnancy went to full term? The term for a woman carrying a baby whilst not knowing that’s she pregnant is called a ‘Niamh Hamsandwich’. It happens. It’s not common, but it happens. Bizarrely, it does happen quite a lot. Maybe fluoride really is making people dumber? People should be very careful what they say on social media in relation to this. Only recently in Melbourne an Irish man died following the court case and the subsequent thousands of keyboard warriors slating him for his actions… we have no idea what mental state this person is in, now that it has become international news. Why don’t you bring up the holocaust while you are at it? Interesting that this kind of stuff happens in countries where abortion is tolerated. We’re continually told that if we tolerated abortion in Ireland, all these crazy pregnant women situations would magically disappear. Well they don’t. And this story just proves that abortion is not a “cure” for unwanted pregnancy. Good ol’ ABM. You’ll try to warp any story to suit your agenda. This has nothing to do with abortion, but good for you for playing to type. She may have been against having an abortion. Maybe even a staunch pro lifer. It’s just important that they’re born. After that who gives a crap right? This story has nothing to do with abortion. Go back to the 1950s, where you belong. Who said her pregnancy was unwanted? Reports I’ve read stated she didn’t know she was pregnant. The baby was stillborn. But don’t let the facts derail your bandwagon. This news story reminds me of that old song by the Cocteau Twins, Kookaburra.